Baeren Chocolate Stout Vintage is Baeren’s attempt at aging their Baeren Chocolate Stout beer over time, and as such, the abv varies from year-to-year; however, this one had an abv of 9%. It’s classified as an imperial stout and is available from winter onwards, usually from January. Even though Baeren Chocolate Stout Vintage is sold at the beginning of January, there is often a push for it to be sold during February, because, yep, you guessed it, Valentine’s day is around the corner. Imperial stouts aren’t meant to be drunk cold – there’s nothing stopping you from doing so, but the flavours only truly come through once the oils have warmed up in the beer. Baeren hit the nail on the head when they called this a chocolate stout as that is the initial flavour that hit my tongue, swiftly followed by a smooth coffee kick that wasn’t bitter nor burnt. What bitterness there was, was so faint that only the bitter-adverse among you would pick up on it and be put off by it. 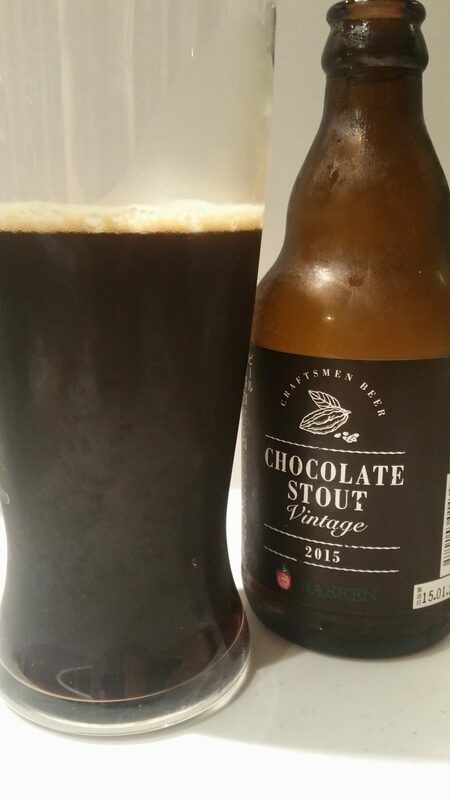 With Baeren Chocolate Stout Vintage changing from year upon year, it’s hard to guarantee a decent bottle of it though if you do manage to get some, try aging one bottle and comparing it to the following year’s edition. I got my bottle from Yamaoka Saketen on a trip to Kyoto. The warmer it is, the faster it ages, basically. The reverse is true. Keep it really chilled and it won’t ‘age’ as much. Yes, definitely these strong beers need to reach a temp where the aromas and flavors are released. It’s almost criminal when they are served at fridge temps. All that effort and expense, basically wasted. Not sure a chocolate st should be aged. More to help the roast and harsher black flavors to soften and merge with the others, like in a barley wine or toasty impy stout. Or a Belgian lambic or sour, where flavors evolve and soften to some extent.